The original NZXT 450 Noctis was a great case with really good airflow and an interesting mesh and angle design that helped it stand out from the crowd. NZXT have now worked with peripheral manufacturer and lover of all things bright and colourful, Asus, for their special edition ROG version, allowing the ASUS patented Aura Sync technology to make their case stand out even more. Let’s get the obvious point out of the way first, shall we? This isn’t a case for those looking for subtle design or standard PC tower features. The £60+ additional cost for this over the older 450 is all to do with lighting and logos and it’s really designed for those who love to show off their machine with multiple lights shining out of every nook and cranny. While this was possible in the past, especially using NZXT’s own HUE+ lighting system which I’m a huge fan of, it was hard (if not impossible) to sync every bit of lighting together to form a coherent pattern. The Aura Sync approach aims to provide one single controller, by way of an RGB connector on the motherboard and software to control it, for all your PC lighting. This can support LED strips, ASUS graphics cards and fans. It’s the next step on from NZXT’s own CAM system, which controls their liquid coolers and HUE+ box. In general, though, this is still the same 450 Noctis as before with the same great airflow, roomy interior and well designed cable management as before. There are still 3 120mm front fans for pulling in cooler air and a single 140mm exhaust fan at the rear. However, these have all been given the Aura Sync treatment and now glow different colours. 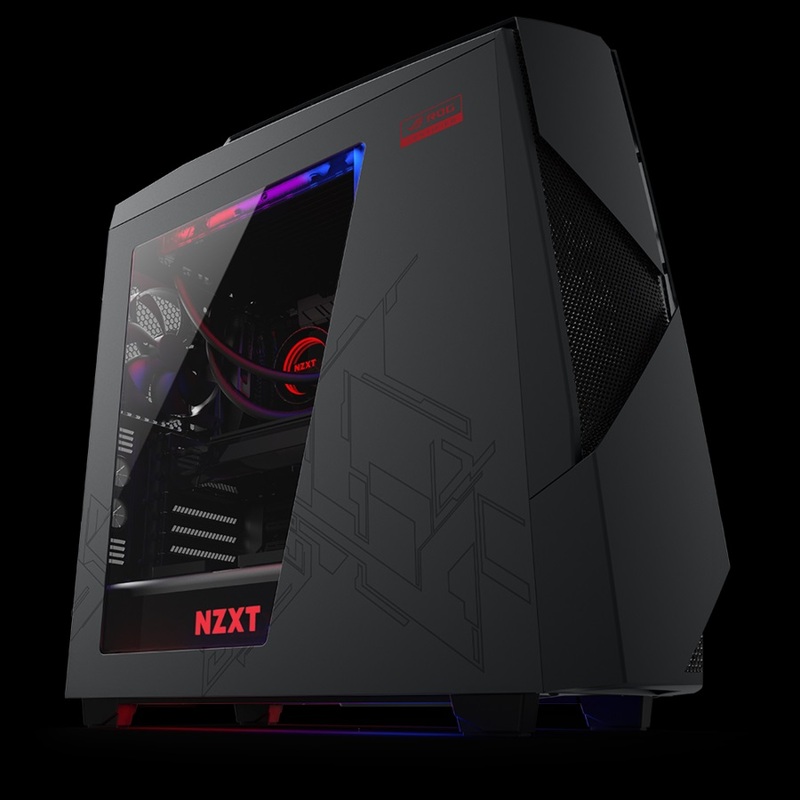 The case exterior is a mix of steel panels and plastic jutting angles designed to improve airflow, with a large perspex clear panel on the left side to show off your build. The top of the case has access to 4 USB ports, 2 of which look like USB 2.0 but were all found to be USB 3.0, useful for faster data transmission, plus the usual headphone and mic port in a handy position. While the instructions that come with the case are pretty basic, it’s fairly easy to take both the front and top panels off the case. The front needs a pull at the bottom to prise it away from the case, revealing the fans and a dust filter and then the top can be pulled from the front in the same manner, though there’s a small hook in the roof on the inside that will also need to be detached. The side panels slide off easily, with the back panel revealing a lot of room for cables to be hidden behind the motherboard and back of the frame, plus 2 controller boards; one for the fans and one for the lighting. Inside the case there’s a lot of space to work with. The hard drives bays appear, as usual, on the right and can be slid out individually for more airflow where needed. One disappointment is that the front panel covering the hard drive bays doesn’t have a slide out section like the H440 and other cases, though clearance for most graphics cards, including the ASUS GTX 1070 in our test setup, was still adequate by removing drive bays.